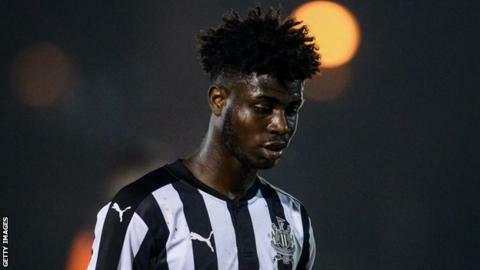 Newcastle United under-23 midfielder Mohammed Sangare looks set to make his debut for Liberia in their crucial Africa Cup of Nations qualifier away to the Democratic Republic of Congo on 24 March. Sangare, who is yet to make a senior appearance for Newcastle, has been named in a 20-man squad released by Liberia coach Thomas Kojo. The 20-year-old was left frustrated after having to withdraw from previous squads due to the loss of his UK residence papers. Sangare, who was born in Liberia but has lived in England since the age of 14, has featured in 16 games in the Premier Division 2 this season. "It is good that Sangare has accepted the call. He had problems with the residence papers but that has since been settled," Kojo told BBC Sport. "We didn't have much time to access him before the Zimbabwe game but his debut [against DR Congo] is now on the cards. He will be a big advantage for us and we need players like that in our national teams," Kojo said. Uncapped Portugal-based Terrance Tisdell, who turned down previous call-ups because he needed clearance to travel to Africa, is now free to travel. Kojo has also handed maiden call-ups to local-based players Marvin Blapoh and Gasimu Sheikh Kouyateh, who helped Liberia reached the finals of the West African Football Union (Wafu) under-20 Nations Cup in Monrovia in May 2018. Experienced South Africa-based Anthony Laffor, who played the last four qualifiers, is suspended but goalkeeper Boison Wynney de Souza, who was born in Spain to a Liberian father and a Brazilian mother, missed out due to a "technical reason", according to Kojo. The match is scheduled for Kinshasa but Liberia want the venue for this crucial qualifier moved out of DR Congo because of concerns over the Ebola epidemic. Any two of the group's four teams, which also includes Zimbabwe and Congo Brazzaville, can still qualify for this year's expanded finals in Egypt.